Vivid description. Coming from heart. And timely tips for us too. 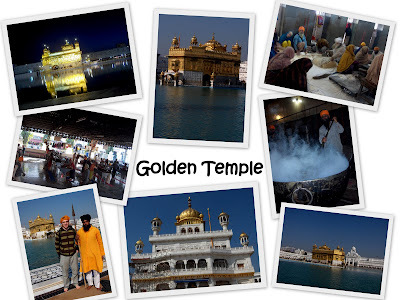 We are also planning to visit Golden Temple twice in Feb 2010 - once in the evening and then again in the early morning hours. We will make sure we go empty stomach to enjoy the simple and divine prasad they offer at the temple. I wish the whole world is full of people like what you have described of Sikh people. visiting the temples are really meaningful and I agree that experience is so blissful to share with anyone. I am awaiting very eagerly to go to Amritsar and the days are fast approaching!!! Bhattoos was the one who made to see the video of Michael Palley's travel experience in Chandigargh. I saw and read his book also wherein the kitchen/food services/preperation were explained. That moment I prayed God that one day I should go to this holy place with Bhattoos. VGood ammulu....I really enjoy reading your blog...keep it up! dvd eating chapatti. nice bhangra music too. Au delà de l'aspect voyage et dépaysement, pas mal les petits effets de montage vidéo. Very interesting insight into your journey, Thanks for sharing!